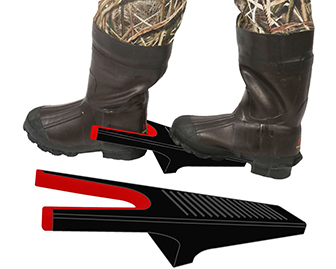 An assistive aid used to help one remove boots without having to bend over. 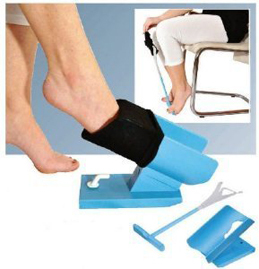 Step on the aid with one foot to stabilize it, place the heel of the other foot in the holder and lift your foot up. Repeat with the other boot. Need good balance to use this device. 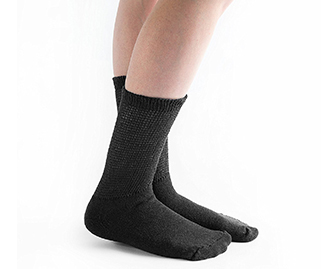 Loose fitting and non binding socks that do not constrict one’s circulation. Great for people that have diabetes and lower body edema. Because they are loose fitting they are usually more easy to put on compared to traditional socks. Laces made that can be attached to any shoe. Due to its elasticity properties, it tightens on its own once you place your foot in the shoe. 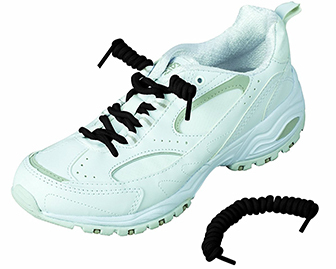 Great for people that have difficulty with tying laces such as arthritis sufferers or those with one sided hand weakness. A bracelet holder that helps one independently do their own clasp. Great for people that live alone or wish to not have help from others with putting on their jewelry. The perfect gift for any woman or male. 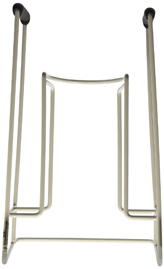 A sock stand that holds a sock open so that a foot can be placed through and donned. Great for those that have difficulty dressing themselves. Can be utilized by those with hand weakness or paralysis of one side of their body. A wire frame that one stretches and puts the compression stocking over to expose the opening. Then the user places their feet inside and the stocking is donned. Great for those people that have difficulty with muscle endurance.